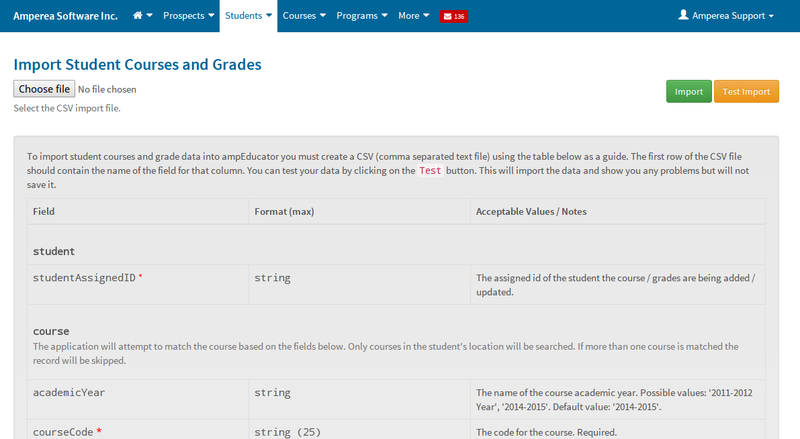 You can now easily import and update student course enrollment and student grades into ampEducator with our new importing tool. The tools allows you to enroll students into existing courses, update their course status if they are already enrolled (i.e. withdrawn, completed, incomplete) and update their grades and final marks. Like with our other importing tools you can test your import before committing to it. For more details please see the import page under Student -> Imports -> Import Student Course and Grades. Over the next couple of weeks we will be adding import and export features to all major areas of the application. If you have any questions, comments or concerns please email us at support@ampeducator.com.